Indian numerology is also known as Vedic numerology because it emerged in the era of the Vedas, some of the oldest and most sacred texts of the Indo-Aryans. 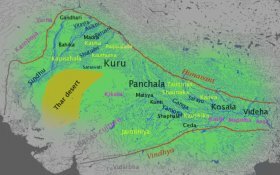 Most of the Vedic period (except the earlier phase of Rig-Veda) occurred from the 12th to 6th century BC, making this system of numerology more or less contemporary to Chaldean and Chinese systems of numerology. Vedic numerology works on the principle of numbers’ vibratory resonance. When one’s action and the vibration of the individual’s number are in harmony, resonance is created. A person’s number works well when resonance occurs. Every numerology system has its own specialty, such as the Chaldean system’s compound numbers. Indian Vedic numerology is based on the idea that everything in this material word is influenced by one or more of the nine planets. Vedic astrology considers the moon to be the most important factor for analyzing an individual’s inner self, the mind, and the soul. It uses the terms Rahu and Ketu to indicate the ascending and descending nodes of the moon, respectively. These nodes also indicate the points where the orbit of the Sun and moon intersect. Rahu and Ketu used to be considered planets in Vedic numerology. According to Indian numerology, individuals have three relevant numbers. Knowing these three numbers means knowing the individual, and he who knows himself, knows the best. A. Psychic number-The psychic number in Vedic Numerology tells the way you look at yourself. It defines your basic characteristics. It reveals what you want to be or about the talents with which you have come to this earth. To obtain your psychic number you will have to find the single whole number of the date of your birth. Only the date is considered and you have to make it in a single one if it is two digit number. If your date of birth is 15th of any month your psychic number is 1+5=6. 1- They are energetic, radiant, authoritative, goal oriented, confident, self-centered, and proud. Time to time these people may be very cruel. 2-They are emotional, shy, moody, passionate, poetic, and romantic. 3-These people are skilled, critical, dynamic, artistic and uplifting. 4-They are for sometimes are unpredictable to others. They are energetic, greedy, selfish but generous and adventurous. 5-This number indicates fickle, always busy type, sometimes childish but youthful and convincing. 6-This is the number for homemaker. They are very caring, charismatic, nurturing, and artistic. They find pleasure in social work. 7- They are spiritual, mystical, poetic, skeptical, and investigative and like to work alone. 8- They are serious, business minded, materially focused, independent and action motivated. 9-This number is of warm and impressive personalities,. They are aggressive, assertive and at the same time benevolent. They are very short tempered too. B.Destiny number-This number in Vedic Numerology will reveal what the world think of you. It is the characteristics that other people find within you. The destiny number is obtained by adding the date, month and year of your birth and then converting that into a single digit whole number. The destiny number for a person takes birth in 15th May 1965 is 1+5+5+1+9+6+5=28=>2+8=10=>1+0=1. 1. They are energetic, courageous, individualistic, commanding, opinionated, rigid, self made leader and always focus for worldly gain. 2- The people whose destiny number is 2 are charming, cooperative, kind, tactful and very sensitive. They are generally truth loving type of people. 3- They are hardworking, busy, confident, cheerful, idealistic, religious and proud. 4- These people are highly intelligent, persevering, radical, helpful and serious with very strong likes and dislikes. 5- They are soft, sensuous, joyous and like verities, They look younger in age. 6- They are home oriented, fine sense of justice, generous, emotional and idealistic. 7- They are unpredictable, lively, dreamer, sociable, sentimental and serious. 8-They will get success through struggle. They are ambitious and possess suicidal tendencies. 9- They are warm, real, responsible, proud, kind, understanding, disciplined and responsive. C.Name number- The name number is called as relationships number. You can have more than one name number if people call you by different names. Changing your name and thus your name number will help you to build relationship and thus overcome the negative influences of your name number. It is very important to know what others think of you to build a strong relationship even with your better half or your child. I consider this number very important because if you know what others are thinking about you can build a strong relationship in your family life, social life or in your business life.